A ship of unknown origins has been discovered drifting in the space between the Althani and Culthan sectors of space. As the ship is in what is “technically” considered to be neutral space, the Althani and the Culthan are aggressively negotiating what should be done with the ship. While they’re negotiating, others have taken it upon themselves to investigate the ship without the blessing of either of the governments. Your party is one of these groups. You know that both governments might come after you because of what you’re about to do, and you also know that you won’t be the only group trying to discover the secrets of this ship, but it doesn’t matter. It’s a ship from the past, and you have no idea of what you might discover on the ship…and that alone makes it worth the risk. 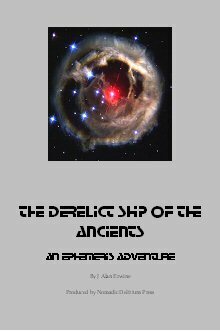 An Ephemeris adventure for 4-6 characters of 6th-9th levels.